For 10 years, we have done what everyone involved in SSD does—volunteer and help a great program! And like most other people, Bill and I volunteer in other ways in our community in Carlisle. One of our favorites is to sponsor an International Fellow from the Army War College at Carlisle Barracks each year. An International Fellow is a senior military officer who joins the US officers for a one-year master’s degree in National Security Studies. Sponsors help the family find a home and get acclimated to the Carlisle area and also spend the year introducing them to life in the United States customs. One custom that Americans take for granted is volunteer work and helping and working with our fellow citizens. When Colonel Robert Bieleny, his wife Jana, and their daughters, Katerina and Christina, came to live in Carlisle in 2011-2012, they had to leave their Golden Retriever, Bella, home in the Czech Republic. They were delighted to learn that we had dogs! And then they were interested in learning about service dogs and clicker training. When they found out that SSD wouldn’t exist without volunteers, they were amazed. They jumped in and volunteered, supporting SD throughout their year in the midstate. They puppy hugged and cared for SSD Midge’s Eastern Star pups, helped Crystal and Alicia (other SSD volunteers) all day in the agility area at PawsAbilities, walked in the Highmark Walk for a Healthy Community, cared for SSD Scarlett in their home, attended SSD’s graduation and volunteer appreciation ceremony, and now back in their home city of Brno in the Moravian region of the Czech Republic, they are avidly follow SSD on their Facebook Page and blog. We were fortunate enough to have the Bieleny family invite us to see their country the way we had shown them the United States. 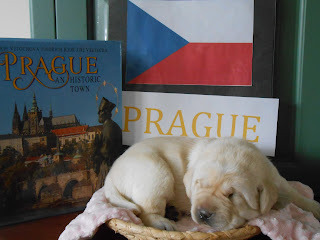 While we were in the Czech Republic, SSD Julia gave birth to her puppies, and we thought it was appropriate to call this litter the Czech litter. The pink-collared female is named SSD Jama, after Jana, who worked hard to prepare many delicious typical Czech meals. The purple-collared female is SSD Garnet, named for the gemstones—garnets—that are mined in the Czech Republic. The yellow-collared male is named SSD Prague, after the historic city that is the capital of Czech Republic. A visit to Prague includes the Sternberg Castle and St. Vitus’s Cathedral (with construction beginning in 1344!) up on the hillside. Down below crossing the river Vlatava (Moldau) is the Old Town Square, started in the early 1300s, with the fascinating Astronomical Clock. Further down the street is the new town—dating from the mid-1350s—with Wenceslas Square, site of the 1989 protest rally that led to the Velvet Revolution and the end of Communist rule. SSD Bohemia, the black-collared male, is named for the western part of Czech Republic. Here in the Bohemian highlands, we visited the medieval town of Cesky Krumlov, which also has a huge castle perched on a hilltop. Somewhat smaller but still lovely was the nearby town of Bechyne, with the military facility where Colonel Bieleny has command of the only engineering brigade in the Czech Army. The eastern part of the country is known as Moravia, and it’s filled with long fields of corn, rye, poppy, sunflowers, and vineyards. The red-collared male puppy is named SSD Moravia. The Bieleny home is located in a small town outside the city of Brno in this area. Several mornings, Robert and Bill went on their morning run over the fields where the battle of Austerlitz was fought in 1805, when Napoleon was victorious over the Russians and Austrians. Brno is also an old city, dating to the ninth century. We all enjoyed the old center of town, and the St. Peter and St. Paul Cathedral. At the top of the cathedral’s spires, the bells tolled the hour and made me and Katerina jump out of our skins! Also in Moravia are the huge limestone karst caves. We took a tour of the Punkva Caves, which ended with a boat ride on the river that flows through and out of the cave. Enjoy the photos of the Czech pups and wish them well on their journey to becoming special services dogs! Bill and I had a wonderful journey as well, thanks to Robert, Jana, Katerina, Christina, and Bella (their lovely Golden Retriever). 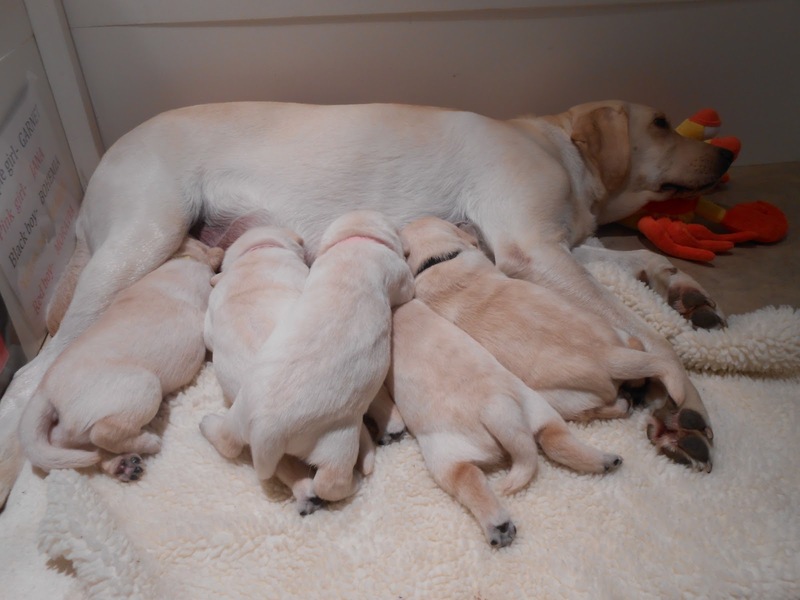 You probably already know that Julia gave birth to her puppies earlier in July. What you might not know is these puppies now have names. Meet Prague, Bohemia, Moravia, Jana, and Garnet—the Czech puppies! 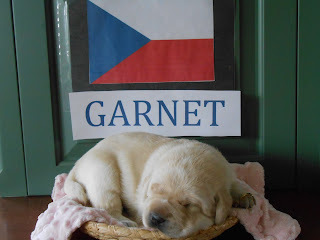 This litter theme and names were chosen by Julia’s breeder caretakers, Susan and Bill. They recently returned from a trip to the Czech Republic, where they were visiting their friends Robert, Jana, Katrina, and Christina. The pups were actually born while they were overseas. The puppies were whelped in the Bohenick family’s home, and they lived there until Bill and Susan returned. Thank you to the Bohenick family for taking care of Julia and the puppies during their first days! SSD Garnet was named after the garnets that are mined in the Czech Republic. She’s wearing a purple collar. If you look closely, you'll see the garnet ring on her toes. 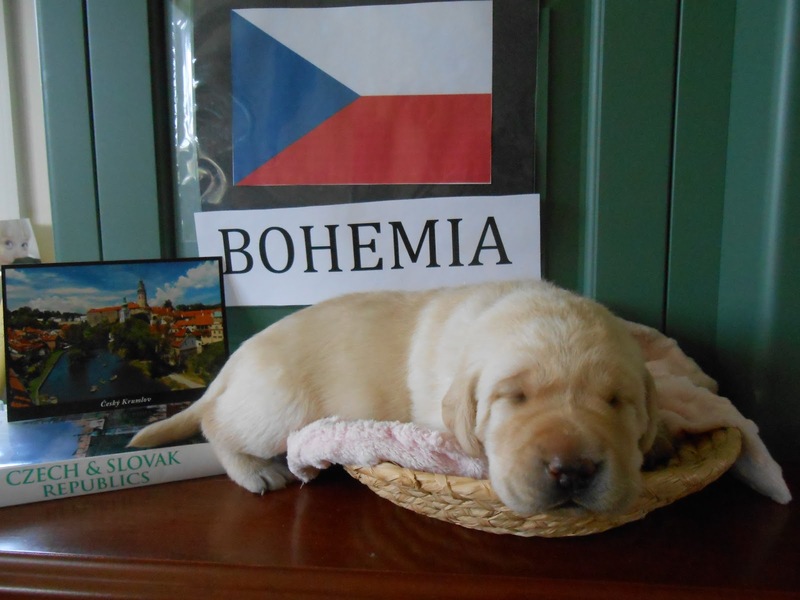 SSD Bohemia is named after one of the large general regions in the Czech Republic. In this picture, he’s posing with a postcard of a town and castle that Susan and Bill visited during their visit. Bohemia, a male pup, is wearing a black collar. 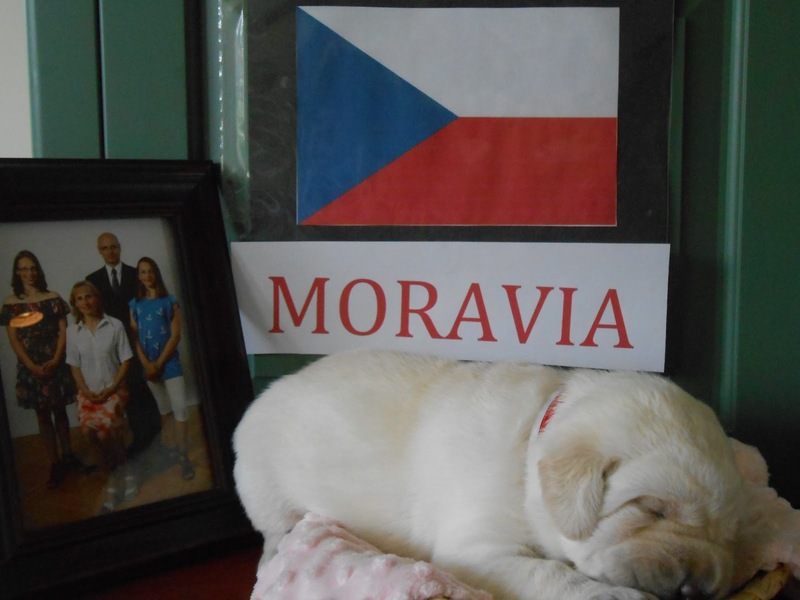 SSD Moravia is named after another of the large general regions in the Czech Republic. 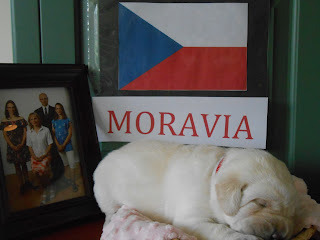 The family that breeder caretakers, Susan and Bill, visited lives in Moravia. The puppy Moravia is a male and is wearing a red collar. SSD Jana is named after Susan and Bill’s friend Jana (pronounced Yah-na). The pup is wearing a pink collar. SSD Prague is, of course, named after the capital city, which has a rich history. In this photo, he is posing next to a book about that history. He’s wearing a yellow collar. In case you’re wondering, the basket that all five puppies are lying in was made in the Moravian region out of grass. The pink baby blanket comes from a friend. Vote Daily for your Favorite SSD Photo for the 2014 Calendar! It’s time to vote for your favorite photo for the 2014 SSD calendar! From July 22 through August 9, 2013, you can vote once every 24 hours for your favorite photo. Tell your friends and family to vote, too! Visit SSD’s Facebook Page to start voting. The 12 photos with the most votes will be featured in the 2014 calendar. We’ll announce the winners on our Facebook Page between August 12 and 16. Calendars go on sale in October. Vote now on SSD’s Facebook Page. Donna, Jim, and Irwin have been working long, hot hours in the orchard and vineyard, which means none of them have had much time for fun. So on Saturday, they took the day off and went to New Freedom to visit Steam into History, where you can relive the history of the railroad during the Civil War. They rode Engine #17, a replica of the Civil War steam engine that Abraham Lincoln used to get to Gettysburg to deliver the Gettysburg Address. The same tracks were later used by his funeral train. The day Irwin visited, there was a reenactor portraying Josiah Gitt, who was a farmer, dry goods merchant, and a community leader during the Civil War. While they waited for the “All Aboard!” they practiced cues. They did verbal cues in a normal voice and a whisper and hand signals. In order to board the train, they had to climb a series of wooden and then metal steps. Both sets were open and narrow. Donna wasn’t sure how Irwin would do. When she cued him to go up the stairs, he took them two at a time, while she only took one step at a time. However, Irwin waited for her each time rather than charging ahead. When they reached the doorway, Irwin automatically did a go on through and sat. To get to their seats, they walked along a metal walkway, which was a little wobbly. Irwin didn’t seem to mind, though. Irwin went under their seat, but because they were so close together, he ended up partially underneath the seat behind them. The passenger cars were hot and sooty from the smoke from the steam engine. Irwin was panting, and Donna was hot, so they decided to move to the open air car. When Irwin got up from underneath the seat, he looked like a zebra because he was striped with soot. The open air car was much cooler, especially from the breeze of the moving train. It also wasn’t as crowded. Irwin was on his best behavior, even though the kids sitting across from him kept trying to pet and play with him. Once the train started moving, it didn’t take him long to settle in and fall asleep to the rhythm of the tracks. Before departing, Donna let the children, the conductor, and anyone else greet him. He loved it. He was very gentle with the kids and gave them puppy kisses. Going down the steps at the junction was much more difficult. The steps were steep and you couldn’t see the next one until you took the step. Irwin did the steps one at a time with his toes spread wide as if he wanted to make absolutely sure he found the step. At the junction, they has some time to stretch their legs and get a drink. Irwin had fun doing some play retrieves with his favorite Chuck-It ball! Re-boarding so they could return to the station was also more challenging. There was just a step stool and then you had to take a huge step up to reach the next step. The conductor was going to entice Irwin to simply leap up, thinking that would be easiest, but Donna told them that Irwin knew cues that could help. While Irwin waited on the ground, Donna used the step stool and then stepped way up onto the next step. She then cued Irwin to join her and he leaped right up! Once he was beside her, they finished the rest of the steps side by side. Everyone broke out with cheering and applause for him! As they walked through the train cars, Irwin matched Donna’s pace step for step. All that loose leash walking practice on and off leash at home is really paying off! Overall, it was a fun experience, and Irwin didn’t have any issues with the steam engine, even when it let off steam, the smell of black smoke, or the train whistle. The first time he heard the sound of the engine letting off steam, he turned around to look but remained calm. Irwin wore his comfort trainer while they were doing the steps and walking through the cars, but otherwise, he just wore a flat collar. Temperatures are supposed to climb into the mid-90s this week, and if recent weather is any indication, it will probably be humid as well. If you’re like us, you’ll try to stay inside as much as possible, especially during the hottest part of the day. Dogs will still need to go outside, however, and if they’re service dogs, they’ll still need to accompany their partners. When spending time in the heat, it’s important to know the signs of heat stroke. Do you know them? You probably know that dogs only sweat through their paw pads. But if they don’t sweat, how do they keep themselves cool? Dogs pant to regulate their body temperature. If they can’t cool themselves off, they start to exhibit signs of heat stroke. A dog’s normal body temperature is about 103 degrees Fahrenheit. If it raises to 104 or higher, your dog has heat stroke. If your dog has the symptoms of heat stroke and doesn't cool down soon, they could collapse, fall into a coma, and even die. If your dog is exhibiting signs of heat stroke, you should immediately take action to cool them down. If they’re outside, move them to the shade or even better, get your dog inside into the air conditioning. Give your dog small amounts of cool water. Be careful not to use cold water or to let your dog slurp down an entire bowlful of water. You can spray your dog with the garden hose, or immerse them in cool (NOT cold) water. Placing cool, wet towels on their armpits, belly, and groin area can also help. Do not give your dog ice as a way of cooling them down. The rapid change in temperature can cause serious medical complications. Remember, you want to gradually cool your dog down. Make sure to monitor your dog’s temperature, and as soon as it reaches 103 or slightly below, stop cooling them down. If you continue to try to cool them down, you may end up giving your dog hypothermia. If your dog has heat stroke, it’s a good idea to take them to the vet. If you have an SSD dog, be sure to call Becky on the Puppy Cell.